Mathematical craft projects can be a wonderful way to teach a child about important concepts without resorting to flash cards and tiresome worksheets. If your child is struggling with math, completing a fun craft project will help him master important lessons. 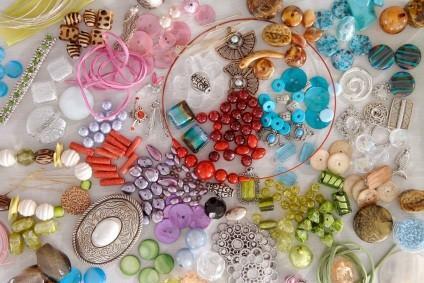 Stringing beads together helps teach children about patterns. Understanding patterns is a basic skill that students in preschool, kindergarten, or first grade use as a foundation for further study in mathematics. When using beads to teach math lessons to children, it's best to work with plastic pony beads or other beads with fairly large holes. Young children don't have the coordination needed to string projects with tiny seed beads. A bead board is also a useful tool, as this will help keep the beads from rolling over your work surface while allowing your child to play with various patterns in the design of the project. Origami is a great way to teach children about measuring and fractions. In origami, paper needs to be measured so it is a perfect square. The paper is often folded into fractions such as 1/4, 1/3, and 1/2. Visit LoveToKnow Origami to learn more about paper folding as a craft form. Danielle's Place has a nice listing of games you can make at home that help to reinforce basic math concepts. Some of the possibilities include a ball toss game, a pick up sticks game, and a searching for treasure game. Learn with Math Games has instructions for making games such as tic-tac-toe and memory, based on lessons in addition, subtraction, multiplication, and division. Crayola suggests using Model Magic clay to create an original board game. Practice the project ahead of time. Make sure you understand the directions and have all the needed supplies before attempting a project with your child. If you're confused and disorganized, your child isn't likely to learn much from the experience. Don't push your own insecurities onto your child. Even if you secretly hate fractions or still have nightmares about your fourth grade math teacher, try to have a positive attitude about what your child is learning. Consider your child's age and attention span when planning a project. Quit before he gets unnecessarily frustrated. Crafting is supposed to make math fun. Celebrate your child's strengths. Some children have strong math skills, while others excel at science, history, art, music, or reading. Remember to praise your child for what he does well instead of simply focusing on areas that need improvement.